EVE Online is receiving a long awaited FPS tie-in in the form of Project Nova, CCP announced at Fanfest today. To find out more aboutwhat we knew about Project Legion, read on. The company has been hard at work on bringing an FPS experience in line with PS3 release Dust 514 to PC for years, previously under the moniker Project Legion. It is now confirmed that this experience will be coming to PC in a slightly different incarnation by CCP CEOHilmar Veigar Pétursson on stage at Fanfest. 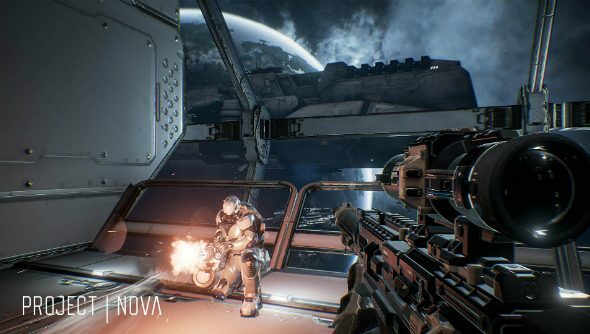 Our eyeballs, hands and ears on the ground in Reykjavik, Jeremy, has had a play with Nova already, and says the shooter is a lot more corridor-based than the sprawling battlefields of Dust 514. The game is being handled by the Shanghai studio CCP Rouge and headed up by Snorri Arnasson, the senior director of Dust. The studio is committed to the theme of this year’s Fanfest which appears to be CCP tying all of their games together. Project Nova does not have a release date yet, but will be targeting 60fps on recommended specification machines and performance is considered very important to the team. Gameplay will be set firmly in the future world of New Eden, a semi-realistic sci-fi setting with the depth of a real world. Players will fight as mercenaries, across asteroids and throughout space, while progression and customisation play a huge part in the experience. Dust 514 allowed EVE players to provide aerial support to troops on the ground in battles on the PS3, however due to the platform disparity audiences failed to overlap.